Digging deeper into a culture war that he's repeatedly stoked, President Donald Trump on Monday called off a visit by the Philadelphia Eagles to the White House Tuesday, citing the dispute over whether NFL players must stand during the playing of the national anthem. Trump said in a statement that some members of the Super Bowl championship team "disagree with their President because he insists that they proudly stand for the National Anthem, hand on heart, in honor of the great men and women of our military and the people of our country." He said the team wanted to send a smaller delegation, but "the 1,000 fans planning to attend the event deserve better." Instead, Trump said he would be hosting "a different type of ceremony," featuring the United States Marine Band and the United States Army Chorus, that "will honor our great country, pay tribute to the heroes who fight to protect it, and loudly and proudly play the National Anthem." Trump continued stroking the fire on Tuesday morning, specifically pointing out the "wonderful music" that would be played along with the anthem during the Eagle-less ceremony. 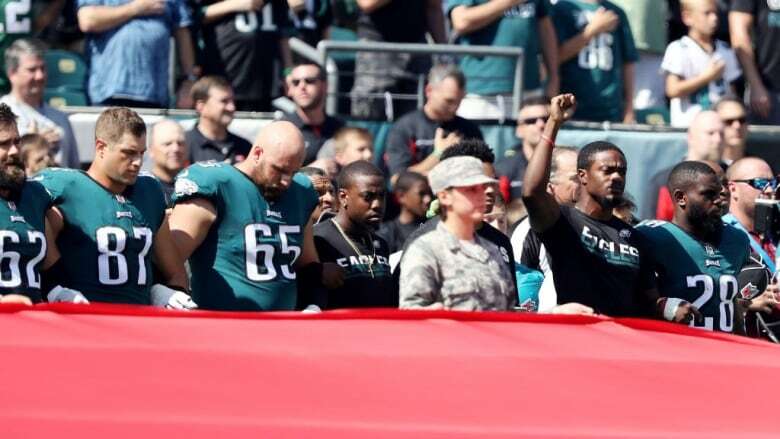 Philadelphia Mayor Jim Kenney replied with his own statement, saying that he is "equally proud of the Eagles' activism off the field" and that the players "represent the diversity of our nation — a nation in which we are free to express our opinions." "Disinviting them from the White House only proves that our President is not a true patriot, but a fragile egomaniac obsessed with crowd size and afraid of the embarrassment of throwing a party to which no one wants to attend," the statement continued. Last week, Eagles safety Malcolm Jenkins said he would not attend the ceremony because he didn't want to be part of a photo op, saying he wanted "to avoid being used as any kind of pawn." In addition to Jenkins, defensive end Chris Long was the most outspoken player against going. Quarterback Carson Wentz had planned to attend. It remains unclear exactly what prompted the change of plans. The White House did not immediately respond to questions about what had sparked the decision and why the circumstances were different from other events honoring winning teams, which some players have boycotted. The Eagles issued a statement without directly addressing the White House cancellation. Last season, Vice President Mike Pence left the 49ers game against the Indianapolis Colts after about a dozen San Francisco players took a knee during the anthem. Pence, who left before kickoff, tweeted soon afterward, "I left today's Colts game because @POTUS and I will not dignify any event that disrespects our soldiers, our Flag, or our National Anthem." I left today's Colts game because <a href="https://twitter.com/POTUS?ref_src=twsrc%5Etfw">@POTUS</a> and I will not dignify any event that disrespects our soldiers, our Flag, or our National Anthem. After the New England Patriots won the Super Bowl in 2017, several players declined to attend the White House ceremony honouring their team last August, citing their differences with the president. In February, the Golden State Warriors declined to attend the White House ceremony honouring their 2017 NBA Championship, instead using their trip to Washington to visit the Smithsonian National Museum of African-American History and Culture.